The latest update in Rich, White People Having Dinner: Mitt Romney and Donald Trump dined together Tuesday night in Manhattan. 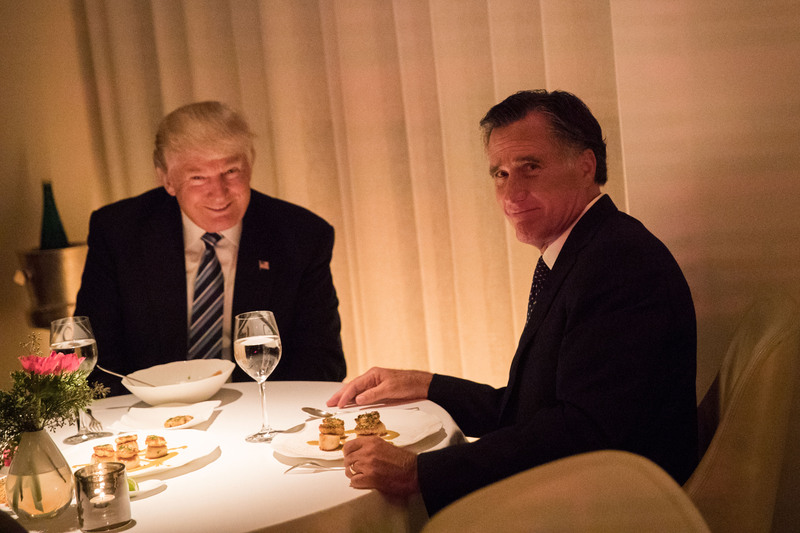 Some reported on what they ate and speculated on what they discussed, but the biggest news to come out of the evening was a photo of Trump and Romney in which the rumored future secretary of state seems to have a less-than-thrilled expression on his face. (Reince Priebus was there, too, but nobody seemed to care.) The photo went viral on social media as Twitter users speculated on what Romney was really thinking as he sat and ate with the future president of the United States, and these seven tweets have pretty great ideas about what was going on in his head. Trump and Romney have had their differences in the past. During the presidential campaign season, Romney called Trump a "phony" and said the President-elect's "promises are as worthless as a degree from Trump University." Trump also had strong words for the 2012 Republican presidential nominee, tweeting he is a "fool" who "totally blew an election that should have been won." Recently the two have been forced to put their past disagreements behind them as Trump has begun the process of assembling his cabinet. This dinner marked the second meeting between the two Republican heavyweights, but, from the looks of the photo, things likely haven't become any less awkward between them. After the dinner, Romney told gathered reporters that the two (and Priebus) had a "wonderful evening." Romney went on to say, "We had another discussion about affairs throughout the world and these discussions I have had with him have been enlightening and interesting and engaging. I have enjoyed them very, very much." However, if these memes and the many others like them have anything to say, it's that the Internet thinks Romney doth protest too much. No telling how many more Romney-Trump meetings it will take before Trump finally announces his choice for secretary of state. What's evident, though, is that if the two do end up working together, there are plenty more awkward Romney memes in our near future.